If you want to learn how to write a good hook for a piece of fiction, see an example how to grab a reader’s attention and make them – force them to – command them to- want to read more, then read the first pages of Amulet Vol. 1: The Stonekeeper by Kazu Kibuishi. From the opening scene of this amazingly drawn graphic novel, you’re hooked. You can’t wait to find out what happens, and, unlike a lot of fantasy stories, you don’t get bogged down in a bunch of exposition from there. Kibuishi finds a way to weave the rules of his world and the lives of his characters into the story. Emily and Navin have just lost their dad. Mom has moved them away from everything they know, moving them into a giant, spooky house that you can feel must be loaded with secrets. Right away you see, just outside of view of the characters, a ghosty, misty spirit lurking in the shadows. Suddenly, things get real. The children’s mom is eaten by the spirit, and the kids, giving chase to the creature, get sucked into some sort of alternate dimension where Emily’s new found amulet seems to be a source of power that can both help her and has the baddies after her. 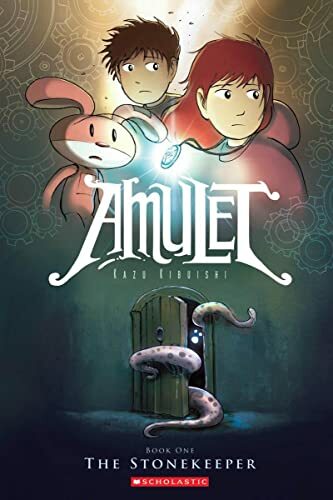 The action is non-stop, the characters fun and interesting, and the world of Amulet is intriguing. I can’t wait to read book 2. This fantastic graphic novel was the 79th book I’ve read this summer on my quest to finish 90 books in 9o days over break.